In an effort to curb gun violence, Seattle police are now following up in person on court orders requiring people to surrender guns. 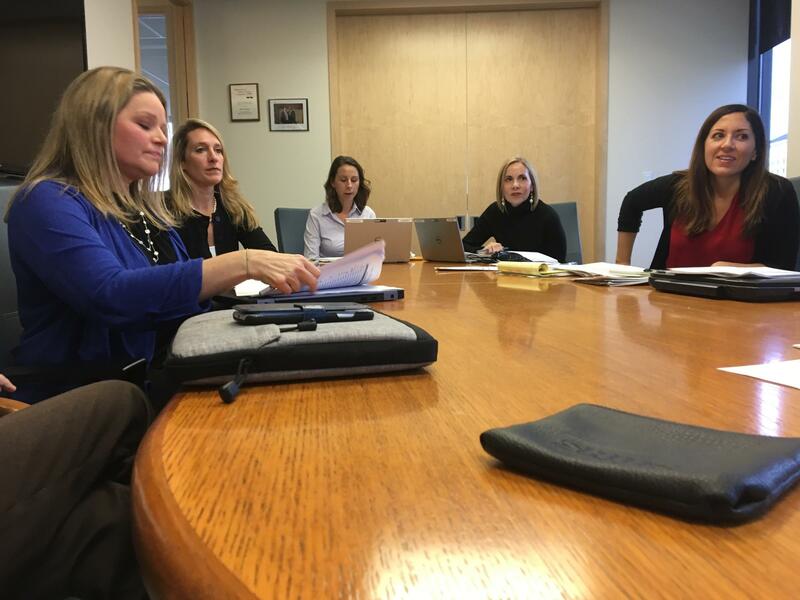 City and county prosecutors meet regularly to review the gun surrender orders and prioritize which ones to follow up on. Seattle Police Sgt. Dorothy Kim and Officer Sean Hamlin, holding the semi-automatic rifle they've just removed from the home of a man arrested on domestic violence charges. It happened again a week later, when a man in Rancho Tehama, Calif., killed four people and shot up the outside of a school. He, too, had been ordered to give up his guns, but verification of his compliance was left to the "honor system." "The system is reactive," says Chris Anderson, a prosecutor in the City Attorney Office in Seattle, Wash. "The court says you're prohibited from possessing firearms, and if you're later arrested with a firearm, then you're guilty ... but there's never been a mechanism in place to go get those firearms." For the last couple of years, Anderson has been part of a collaboration between the city and King County to curb gun violence. One of the first things the group did was measure the compliance rate for orders to surrender weapons. It turned out to be shockingly low. In 2016, 56 percent of the people who received the orders simply ignored them. And of those who did respond, a suspiciously small number actually surrendered any guns. That's why Seattle police are now following up on those court orders — in person. Officers Ellen Kernan and Sean Hamlin spend their days contacting people who've just been ordered to surrender their firearms. The orders are usually the result of a domestic violence incident. The officers often seek out accused abusers at their workplaces, where they're more likely to be cooperative. "Do you have any guns?" Officer Kernan asks a barista, after she's asked him to step outside the coffee shop where he works. The barista's girlfriend has filed for a temporary protection order, and told investigators he owns a handgun. But the barista tells Kernan he doesn't. "I've never even handled a gun," he says. Right now, the officers have no choice but to accept that. "Who to believe? I don't know," says Officer Hamlin, on the way back to their car. It's complicated work, figuring out whether someone owns a gun. Government records are little help — the state tracks purchase histories, but only for licensed gun stores, not gun shows and one-on-one sales. One police officer on this task force dismisses the tracking system as "full of holes." This is one of the main explanations for why police so rarely follow up on gun removal orders in America: It takes a lot of time and effort. In Seattle, there are now money and staffers dedicated to the effort. Prosecutors and law enforcement meet on a regular basis to review the surrender orders coming out of the courts, and target the most urgent cases. When they suspect gun owners are holding out on them, they have the option of asking for a search warrant. Officer Hamlin says that usually depends on how detailed the victim's claims are. "If she has specific allegations of, 'I saw this gun, he always has this gun on him,' or, 'He always hides it under his pillow when he sleeps at night,' more likely than not we would get that search warrant signed by the judge and go do it." The problem with search warrants is they can provoke a defensive reaction by the gun owner, escalating the danger for police. That's why searches require the participation of a SWAT team. So in most cases, the gun removal task force chooses the route of persuasion. Anderson says that means a lot of time on the phone, talking to the gun owners' lawyers — and their family. "We call people's moms, we call their aunt, we call their uncle," he says. "And we explain to them, 'look, he's not just a risk to the victims, and he's a risk to himself. And it's just better if we have the guns.'" The approach is working, according to preliminary numbers. As the inter-jurisdictional gun removal effort ramped up last year, the number of guns surrendered sky-rocketed. As many as 134 firearms were turned over in 15 weeks — that's compared to 124 guns surrendered in all of 2016, before the effort was launched. So far, the jump in surrendered firearms has not alarmed gun rights groups. "We've had no complaints from anybody in the public that King County has violated anybody's rights," says Alan Gottlieb, with the the Second Amendment Foundation. "We also don't want guns in the hands of prohibited people." This emphasis on improving the enforcement of existing gun laws is also giving hope to gun control groups, many of whom see it as the only politically viable strategy for reducing gun violence, at least in the short term. A number of states — including some in pro-gun rights regions of the country — have been changing policies to make it easier for law enforcment to find out whether felons and other "prohibited persons" are in possession of firearms. "When we do polls and look at the data... we find that with issues like domestic violence restrictions, actually there are areas where there's a high fairly high amount of agreement," says Shannon Frattaroli, with the Center for Gun Policy and Research at the Johns Hopkins Bloomberg School of Public Health. 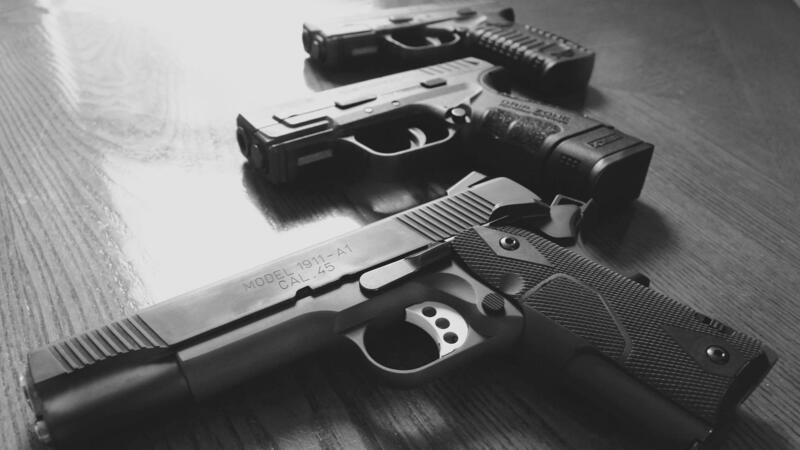 Frattaroli focuses on guns and domestic violence, and says the research shows the life-saving value of having police remove guns from a house soon after an incident. "We know that that period of separation, when a woman is separating from a man, is a very dangerous time for her," she says. With that insight in mind, the gun removal program in Seattle often tries to visit the home of a domestic violence victim while the alleged abuser is still in jail. SPD Sgt. Dorothy Kim, who leads the police portion of the gun removal team, is doing just that — visiting the apartment of a woman whose boyfriend just spent the night in jail on domestic violence charges. Kim wants to collect his firearms before he posts bail. "It gives you guys a chance to cool off and make sure everybody stays safe," Kim tells the girlfriend. "That's the point of getting the weapons before he's released. It's better for law enforcement, it's better for you, it's better for him, really." The girlfriend readily agrees. This approach doesn't require a warrant, because the girlfriend also lives here and can consent to the search. 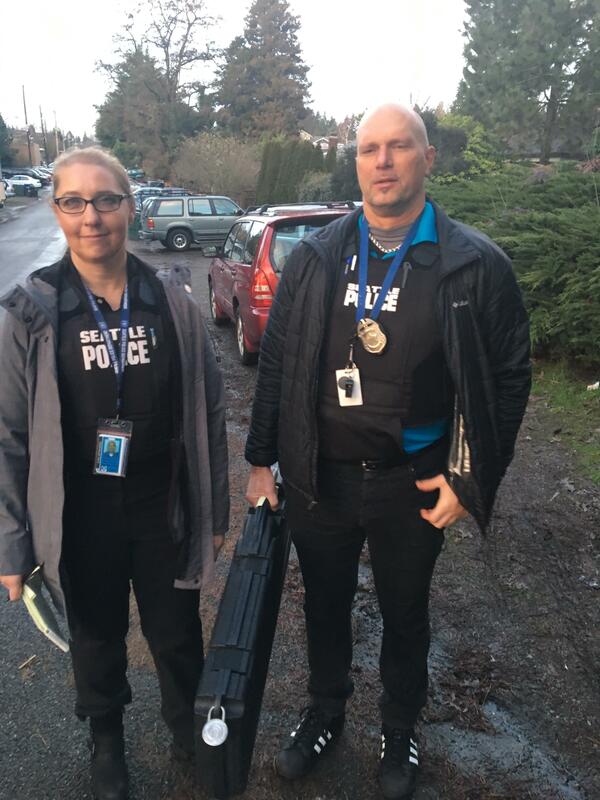 Just in the past few weeks, searches with the permission of live-in girlfriends or partners have led Seattle Police to discover two large caches of weapons and ammunition — dozens of guns and tens of thousands of rounds. In this apartment, there's only one gun, a semi-automatic rifle. Still, Sgt. Kim says it's a step in the right direction. As she takes the rifle to her car, she says there's a good chance the boyfriend will avoid a domestic violence conviction and eventually get the gun back. "But I feel better just knowing that at least during this time when emotions are running high, we've gotten it out, at least for a little bit," she says. After a mass shooting in this country, there are all kinds of questions about how the shooter was able to get a gun. Courts have long prohibited certain people from owning guns, like felons and people with domestic violence convictions. But in practice, the criminal justice system rarely checks to make sure guns have actually been surrendered. NPR's Martin Kaste has a story about one city trying to change that. MARTIN KASTE, BYLINE: In a coffee shop in downtown Seattle, two police officers have come to see the barista. They take him outside, and they serve him with a temporary protective order filed by his girlfriend. ELLEN KERNAN: Don't have any more contact with her - no calls, emails, text, nothing. OK? KASTE: So far, this is pretty normal. But then Officer Ellen Kernan starts grilling him about weapons. KERNAN: Do you have any guns? UNIDENTIFIED MAN: I have no weapons. KERNAN: Do you have a CPL? KASTE: They're asking him about a gun because his girlfriend says he has one. So a court has told him to surrender it temporarily. But this is the kind of court order that often gets ignored. In 2016, there were 875 gun surrender orders here in King County. And of those 875, only 52 people actually turned in guns - which is why there is now this new effort to send cops out to follow up in person. KERNAN: But absolutely don't have anything? KASTE: The problem is, if someone insists he doesn't have a gun, the cops are often stuck. SEAN HAMLIN: I don't know who to believe. I don't know. KASTE: That's the other officer on this call, Sean Hamlin. It's no simple matter, he says, figuring out whether someone owns a gun. The state's firearm purchase records are incomplete. Full of holes is how one cop describes them. So Hamlin says their next move probably depends on what the girlfriend says. HAMLIN: If she has specific allegations of - I saw this gun, he always has this gun on him, or he always hides it under his pillow when he sleeps at night - more likely than not, we would get that search warrant signed by the judge, and we would go do it. KASTE: Whether to get a warrant or whether to even follow up on a gun removal order, that's a decision made in this high-rise conference room. UNIDENTIFIED WOMAN #1: Was anything else on today's calendar that we wanted to talk about? KASTE: This is the heart of Seattle's new gun removal effort. It's an unusual collaboration between city and county prosecutors and law enforcement. They're going about gun removal in a whole new way, which is getting some national attention. What they do is review the list of gun surrender orders that come out of the courts every week, and then they target the most ominous ones. UNIDENTIFIED WOMAN #3: She had also called 911 to report the stalking. So I assigned one of my detectives to work on that case to make sure that we could charge on it because then we have leverage to make sure that he turns in all of his firearms. KASTE: Leverage - around this table, you hear that word a lot. And that's because this work often consists of just convincing people to give up their guns. City prosecutor Chris Anderson says that can mean just calling the gun owner's family. CHRIS ANDERSON: We call people's moms. We call their aunt. We call their uncle. And we call everybody that we're able to talk to. And we explain to them, look, he's not just a risk to the victims, he's a risk to himself. And it's just better if we have the guns. KASTE: The laws prohibiting certain people from owning guns are not new. What is new here in Seattle is this strategic effort to enforce those laws. And it's working if you judge it by all the guns that are stacking up in the police evidence room. And so far, the gun rights movement seems OK with that. ALAN GOTTLIEB: We've had no complaints from anybody in the public that King County has violated anybody's rights. KASTE: Alan Gottlieb is with a group called the Second Amendment Foundation. GOTTLIEB: We also don't want guns in the hands of prohibited people. And so as a result, I think what the county is trying to do is good. We just want to make sure it's done right. KASTE: For many gun control advocates, this is now looking like the most workable strategy - emphasize improved enforcement of existing gun laws. Even states with permissive regulations, such as Wisconsin, have recently made it easier for police to take guns from domestic abusers. The research has shown how effective this is in preventing violence, especially in the first hours after an incident. KASTE: And that's what Seattle Police Sergeant Dorothy Kim is doing right now, knocking on the door of a woman whose boyfriend was just arrested for domestic violence. Kim wants to convince the girlfriend to turn over her partner's gun before he posts bail in a few hours. KASTE: The girlfriend doesn't need convincing. She hands over his semiautomatic rifle. The officers check it. HAMLIN: And it is definitely not loaded. KASTE: And soon they're out on the street with the rifle in hand. Sergeant Kim says she realizes this is probably temporary. Domestic violence victims often drop charges eventually. And if the boyfriend escapes conviction, he'll get the rifle back. But Sergeant Kim says she feels better knowing that right now, while emotions are running high in that apartment, the gun is out. (SOUNDBITE OF SOUVARIS' "PIBNO") Transcript provided by NPR, Copyright NPR.